DELTA, British Columbia (CNS) — A few years ago, Deacon Dileep Athaide could never have guessed he’d become a frequent visitor on the immense coal and container ships dotting the horizon in Delta and Vancouver. 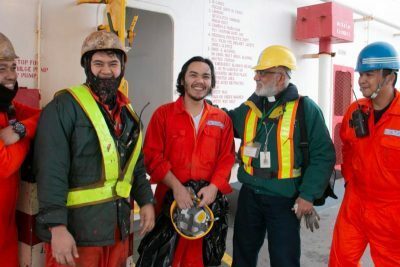 Yet nearly every day, he finds himself donning a hard hat, reflective vest and steel-toed boots, chatting with security guards who recognize his white collar and climbing high ladders into cargo ships as a chaplain to seafarers. “It’s only three years that I’ve been doing this, but it feels like 10 years — in a good way,” Deacon Athaide, 69, told The B.C. 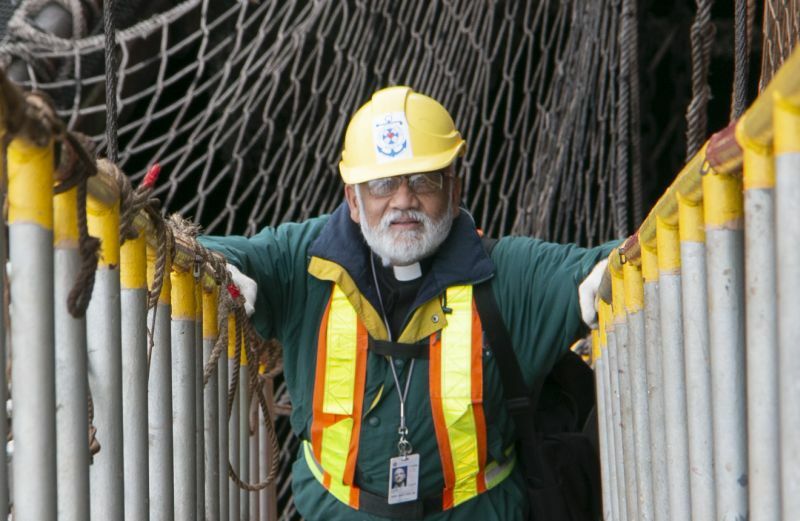 Catholic, newspaper of the Archdiocese of Vancouver, while on board a Japanese coal carrier at Westshore Terminals in Delta. The two dozen crew members on this ship are from the Philippines and have spent months away from their families, religious customs and country. “For the seafarers, it’s a paradox. In order to look after their families, they leave their families,” the deacon said. They may make anywhere from US$12,000 to 150,000 a year, but even those on the lower end of the scale are grateful for the job, since it’s often more than they would make back at home. Being stuck on a ship thousands of miles from home, and at times waiting an entire month to set foot on land, is a daily challenge for seafarers. Deacon Athaide boards these vessels to offer prayers, rosaries, ship blessings, a listening ear, and a free ride out of the port to a nearby mall or church. As a deacon, he can’t celebrate Mass or hear confessions, but he can invite a priest on board, or bring Communion and lead a service. He also drops off day-old treats donated from a local bakery and, on special occasions, like Christmas, gives away thousands of gift-wrapped hats, scarves, jackets and chocolate bars. “The pastoral and the practical needs are all intertwined. It’s through the practical means that they open up and you get a relationship,” he said. Seafarers connect the world. Coal ships at Westshore Terminals handle more than 30 million metric tons of coal per a year. Last year, Canada’s largest port, Vancouver, handled 147 million-or-so metric tons of imports and exports — cars, coal, grain, oil, sugar, tech — valued at $200 billion. Though seafarers provide a bridge to the world, they are disconnected. Only recently has WiFi become readily available on board, and, inspectors aside, Deacon Athaide may be the only visitor these sailors entertain for months. The men usher Deacon Athaide through the galley and into the officers’ mess, where the higher-paid crew gather to eat. The cook’s assistant quickly distributes a few water bottles and soon brings out lunch: fried noodles, fresh salad, and a sausage-egg-meatloaf combination. Whenever he meets a crew member, Deacon Athaide asks: “How are you? Is everything OK?” The response is often ” fine,” but he’s ready to listen, say a prayer, and offer consolation any time a serious situation arises. In just three years, several have. “About six months ago, a chief cook died a day before coming here.” The man, practically in sight of the port, had run out of critical medication too soon. Another time, a chief engineer had a heart attack and died at sea, also one day before his Vancouver arrival. In both cases, Deacon Athaide offered to bless the ship with holy water and prayed for the men who were traumatized after the deaths. “If they were at home, they would be at Mass with their family, with their kids,” he said. Spending his free time on cargo ships wasn’t exactly Deacon Athaide’s retirement plan. A man of many interests, Deacon Athaide has been a geologist, professor, labor leader, and even a thoroughbred horse owner. Chaplaincy came as a surprise. Born in a devout Catholic suburb of Mumbai, India, he was deeply rooted in his faith from a young age. He would pray the rosary with his family every day, but did not consider becoming a priest and had never heard of permanent deacons. As a young adult, he had a heart for service. When he noticed a trend of young adults traveling overseas to do mission work, he founded the Communitas International Volunteer Society. The registered Canadian charity sent volunteers to a developing country for one year at a time, and it was while traveling with his organization that he met his wife. He and Malvina, a nurse, raised three children. When their youngest was only 7, Malvina was diagnosed with ovarian cancer. She died in 2004. In 2011, Archbishop J. Michael Miller released a letter to announce he was restoring the permanent diaconate in the Archdiocese of Vancouver. Permanent deacons, he wrote, would have a theology degree and run a variety of parish and other ministries, including being allowed to officiate at marriages and funerals and preach homilies. He registered and spent four years in formation through the permanent diaconate program at St. Mark’s College. He became one of the first permanent deacons ordained in the local church in 2015. After his ordination, Deacon Athaide was given the mission of reaching out to seafarers. It has been a long, unexpected journey, but one he finds incredibly rewarding. “Five years ago, I never would have imagined I would do this port ministry, and yet it seems so natural to me,” said Deacon Athaide, who boarded 260 ships and met 5,500 crew members in 2018 alone.